Twice a year RE/MAX Capital City pits office against office in a Bowling Showdown. The concept is to get as many people as you can to bowl for your office – agents, family, friends, neighbors, anybody – so that you get the most amount of pins (or points). The winning office receives the coveted bowling trophy and bragging rights. 2010 was dominated by our Round Rock office – they won both the Fall and Spring Showdowns, by A LOT. 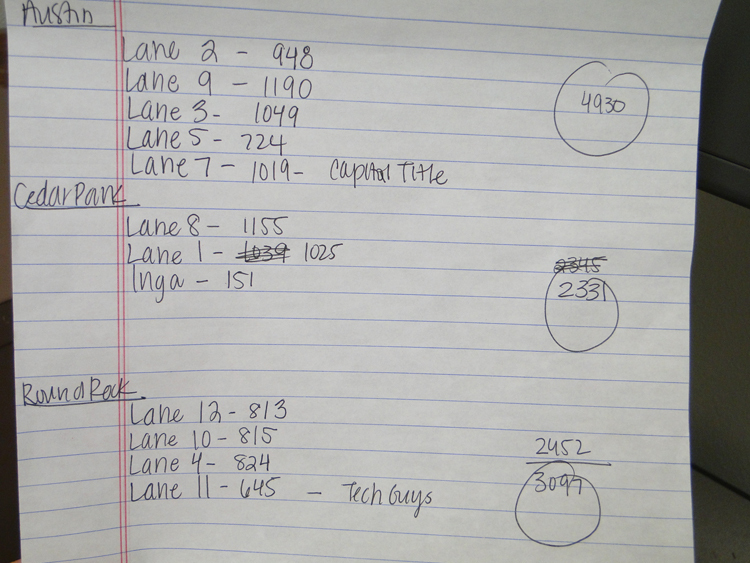 2011 Spring Bowling Showdown results – Austin takes the win! This year however, there seems to be a shift. At the May 11, 2011 Spring Bowling Showdown the Austin office came to win. Brian Kerman, an Agent in Austin, was instrumental in getting the agents on board to show Round Rock and Cedar Park who’s the boss. Great job Austin! Also different this year, we decided to hold a raffle for 3 – 1hr massages courtesy of Don Garritano, CitiCon Construction. Because of this generous donation we were able to raise $96 that we will use in support of our 2011 adopted holiday families. Thanks CitiCon! !